This male blue was good to me, pausing to very methodically nectar at these little yellow blooms. 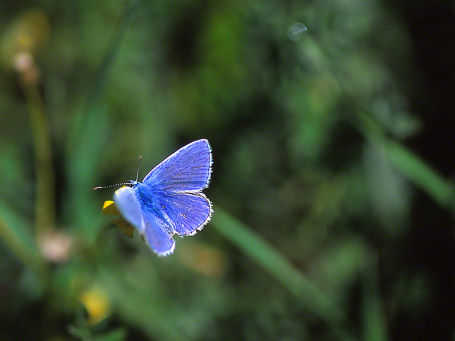 Alone there in this lush valley, my ID is Polymmatus Icarus Zelleri, the Common Blue. I’m not certain though, and I note those yellowish tips on the antennae. So, is it possible that . . . . Truth be told, I too open those Youtube videos of lions, elephants and rhinos charging photographers in the field. When these diminutive blues swoop in, the level of excitement is measurable, very. Oh, and I love the blues. Me and Frank.